The United Nations Environment Programme (UNEP), along with the Bloomberg New Energy Finance (BNEF) and its Frankfurt School, released the 10th edition of the Global Trends in Renewable Energy Investment report recently. The report shows that investment in renewable energy (excluding large hydro-electric projects) has increased by five per cent to touch US $ 285.9 billion in 2015. This is the highest since 2004 when the UNEP had first started reporting investments in renewable energy. 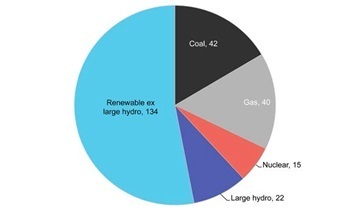 The positive thing is that it is more than double the amount (US $ 130 billion) invested in coal and gas capacity additions across the world. “Renewable energy set new records in 2015 for dollar investment, the amount of new capacity added and the relative importance of developing countries in that growth. All this happened in a year in which prices of fossil fuel commodities—oil, coal and gas—plummeted, causing distress to many companies involved in the hydrocarbon sector,” the report says. The most notable part of the renewable energy investment in 2015 is that the developing world has taken major steps. China, India and Brazil committed a total of US $ 155.9 billion as investments in the sector. It was not only 19 per cent higher than 2014, but also about 10 per cent more than their counterparts in the developed world. 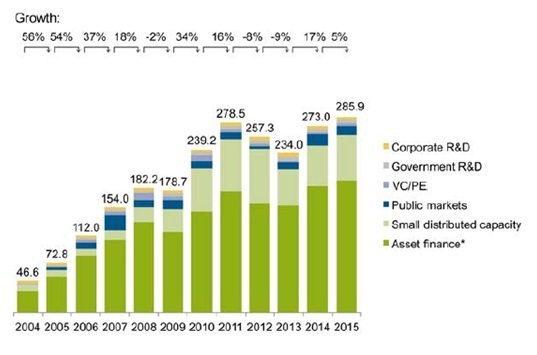 In 2015, China was by far the largest investor in renewable energy. It invested US $ 102.9 billion, an increase of 17 per cent over the last year. Both on-shore and off-shore wind power saw huge investments in China amounting to US $ 42 billion for adding an installed capacity of 29 gigawatts (GW) and 5.6 billion respectively. Solar PV saw an investment of US $ 43 billion which was a 19 per cent rise from last year. It aims to install 19 GW capacity. Capacity addition in the energy sector stood at 253 GW out of which 134 GW was in renewable energy (62 GW in wind and 56 GW in photovoltaics were installed in the current year). The report shows that the developing world is doing much more than the developed world to augment renewable energy development. This seems very important after COP21 in Paris last December when India and China were attacked for their dependence on coal. These countries are the ones who are investing in renewable energy more than the developing ones. Healthy sign. Wind Energy is more efficient and matured than solar energy. 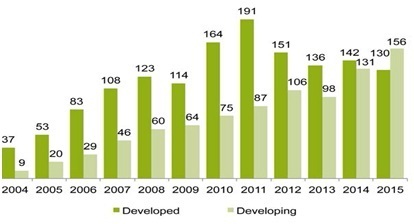 With more and more offshore wind projects in the pipeline wind is the dominant among renewables around the globe.